"The ambient electronic genre has been heavily colonized by dance and world music, a fact that makes Bone's pure, gauzy synthscapes seem fresher than they might otherwise. His evocative, almost primitive sound harkens back to the purity of Eno's Music for Airports. Very little happens, yet somehow a spell is cast." "After spending a couple of albums in the electronica lounge, Richard Bone returns to his ambient home in this CD of slow, dark, shimmering soundscapes. Bone has a nice touch on synthesizer, recalling Steve Roach's early drift works like Structures from Silence." "Etherdome is definitely a very fine album and balances out beautifully the more experimental offerings on Hypnos with a smooth, refined and intimate ambient album, unfortunately aren't made that often. Beautiful." "...his best yet: not too dark, not too light, not too melodic, not too abstract." "Unlike The Spectral Ships, Richard's previous work on Hypnos, which gets quite dark at times, Ether Dome has a fine balance between pure atmospheric tracks and predominant melodic ones. The fact that stands out is Bone's ability to achieve the maximum effect with repeating occasional minimal patterns of seductive synth sounds." "Richard Bone is a god - let's be honest about it. How else can you explain him recording four albums as good, and yet as different, as Electropica, The Spectral Ships, Coxa, and now, Etherdome, all in the course of just two years? I have used up my thesaurus on this guy. I have no superlatives left. Oh well, time to repeat myself. The man of a thousand (musical) faces has released Etherdome, a stunning ambient album. Leaving behind the darker shadings and noir textures of his earlier The Spectral Ships, Richard traverses into warmer and more spacy territory. Sounding like a hybrid of James Johnson, early Jonn Serrie and the more electronic side of Tim Story, Richard creates a emotionally soothing yet sonically challenging collection of songs that somehow are vintage Bone yet also refreshingly new. (Damn, I gotta get a better thesaurus!). Song titles are deliciously obscure (at least to me) but the music contained on Etherdome is wonderful. The album opener, "The Induction of Gilbert Abbott," has floating piano-like notes counterpointed by swirling lush washes of synths and synth choruses. It's a classic space music track for sure. "Unawakened" begins with some quasi-Tim Story minimalism, as a subtly muted electric piano and synth entertain a delicate yet beautiful simple refrain, soon joined by low key synth strings. As the album progresses, songs continue in a relaxed yet never soporific vein. Trust a genius like Richard Bone to record an album that can be this serene while still infusing the music with enough "quirkiness" (sorry, couldn't resist) to keep it away from any new age noodling or over-the-top relaxation excesses. How does this guy do it? Of course, this wouldn't be Richard Bone if some stuff here wasn't really unique (the idiosyncratic "The Letheon Men" which is about as dark as this album gets - and that's not very dark). On several cuts, for example, "Peripheral Nerve" with its subtle semi-vibes, the astute listener may even pick up shadings reminiscent of Coxa. "Lucidity Soul," likewise, could also be a cut on Coxa, but slowed down - way down! "Plateau to Level 30" does have a small amount of spookiness to it, with its use of "breathing" effects, but later in the song major key synth washes bring the song back into safe territory. "Silverwake" is, perhaps, the best cut on the album. With two different minimal piano lines and underlying gentle synths, it just fills the air with pure ambient bliss! Since this is a Hypnos label release, it's sonically perfect with excellent mix and top-notch production and engineering, as well as label head Mike Griffin's characteristic starkly beautiful CD layout and design. In case you haven't gleaned this yet, Etherdome gets a super huge thumbs up from me. Positively a "must get it NOW" for all ambient lovers and, in my opinion, space music fans as well. Richard, I'm beggin' you. Please. Do not release any more masterpieces for awhile. I gotta give my brain a rest from coming up with adjectives. Could you maybe do a Partridge Family tribute album - there's no way that even you can salvage that, or can you?" "Fantastic cd, this. In terms of the quality of the music, but not neccesarily the sound, it reminds me of the first cd of Vidna Obmana's Memories Compiled 2. Very gentle drifting ambient would be my very vague but positive opinion." "On the Etherdome CD Richard Bone presents us with 11 tracks meant to nourish and calm the listener. Without a doubt the most uplifting of all the Hypnos label releases, Etherdome is at once beautific, elegant and simple yet thankfully absent of the typical new age grandeur and posturing. The knowledgable listener will no doubt notice the influences of EM greats Hans-Joachim Roedelius, Brian Eno and Cluster as well as Bone's skill in producing an album of character, sensitivity and charm." "Etherdome, multi-faceted synthesist Richard Bone's second in a series of atmospheric albums on the Hypnos label, is a warm yet mystery-filled work exploring several different musical approaches. Some tracks, like the album-leading "The Induction of Gilbert Abbott," have a planetarium-esque feel to them, with shifting, spacey sounds and deep voices welling up out of the fog. "Plateau to Level 30" is among the best in this regard, with its distant, vaguely percussive sounds breaking up the synthesizer washes. Other pieces take a more conventional, melodic synthesizer approach. Sometimes this is successful, as with the contemplative "Unawakened." In other places, Bone falters, as with the misdirected smooth-jazz track, "The Incubus Wave." In general, Etherdome is working within a fairly well-worn paradigm of synthesizer-based, meandering soundscape, yet Bone finds ways to make this music feel new, perhaps through his unusual mix of softness and austerity. 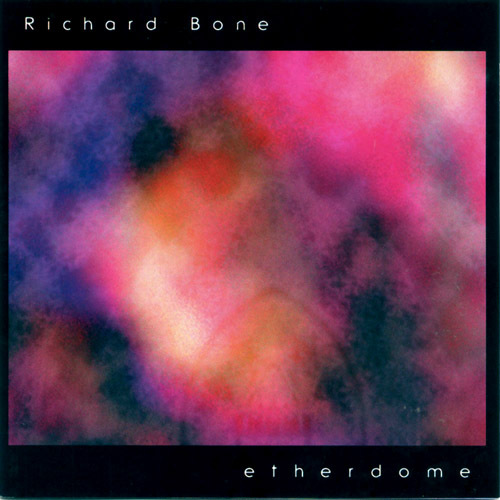 Adding another chapter to the diverse musical output of Richard Bone, Etherdome is worth exploring for space/ambient fans and Bone fans alike." "Richard Bone's visit to an early medical site (where modern anesthesia was experimentally developed) "conjured up images of souls drifting in and out of consciousness". With this vision, he created his own Ether Dome to capture the ephemeral, transportive state of slipping away from reality. Dr. Bone administers his recommended dosage (11 tracks) of space music, that is inner space music, the songs of the mind and soul as they slip into an ether-induced state of weightlessness (and beatlessness). Lush choral "ahhh"s are swept by synthetic breezes and painted with slow, diffused notes as The Induction of Gilbert Abbott sets the tone for this dreamy collection. With perhaps a slight hint of melancholia, Unawakened (3:05) floats on a shifting sea of soft tonal activity and synth string mists. The muffled e-piano sounds of Calenture are somewhat reminiscent of Bone's "loungier" works (as found on Coxa or Electropica) as transformed through the anesthetizing filter of ether, slowed down and softened. Strangely distorted voices announce the prescence of The Letheon Men; between their bubbly murmers, strands of synthflow morph and swell with slow-motion grace, to be joined by hushed piano notes. The Peripheral Nerve extends through a region of ethereal keyboarding, sweet shimmers and a buzzy current of energy. The Incubus Wave's breathy gusts of synth meld with flowing currents, rolling tones and odd, organic (sorta goose-like, actually) ripples. Warmly wafting streams wash placidly atop the Plateau to Level 30 (6:15), while windy undertones blow beneath; soon a meditiative sequence of pillowy notes is applied. Ebbing and flowing, the sounds of Society X emit from a steamy core, spiraling outward with brassy resonance. As trilling whisps flitter skyward, The Shadowing Wall pulses with rippling, shifting soundwaves and meandering notes. Richard Bone's tour of the Ether Dome brings back the rewarding mental souvenir of 55-minutes of free-floating sounds which are both ambient and musical. You don't have to be semi-conscious to enjoy these 8.4-rated sessions of serenity." "Richard Bone is a musical enigma. One minute he is doing bossa nova music, the next minute he is doing dark ambient music like his prior Hypnos release, The Spectral Ships. This time around, he finds himself again exploring ambient terrain, but the mood on Etherdome is more reflective and surprisingly beautiful. I wouldn't normally expect to use the word restraint in describing the majority of Bone's work, but fans of Harold Budd and early Eno should find this a welcome addition to their collection. On "Calenture," soft piano and plucked bass are laid delicately on a bed of swirling sound pools. The atmosphere is cool and calm. Softer still is "The Letheon Men," which borders precariously close to new age without quite stepping over the edge, thanks to a healthy dose of ambience washing over the pretty lead lines. A little more abstract, but still quite peaceful, is "Peripheral Nerve." Bone's influences from other musical arenas creep in, but only occasionally. "The Incubus Wave" includes some slightly jazzy electric piano chords, but throughout Etherdome the music is firmly rooted in the ambient territory that Hypnos is known for. In fact, the music here may result in the coining a new term, "light ambient," to add to the burgeoning flood of subgenres in contemporary instrumental music. This is a perfect album for late night listening, right before bed. The CD becomes progessively quieter and more soothing with each subsequent piece, though the energy does pick up slightly on "The Shadowing Wall," which has a delicate pulsing beat set against some nice solo piano. Sit back, relax, and enjoy." "In the very short time that has passed since its foundation, the Hypnos label has succeeded in gathering almost all of the current major purveyors of classical ambient under one umbrella - Vidna Obmana, Jeff Greinke, Robert Rich and many more essential names now regularly release recordings under its imprint. Another, undeservedly lesser-known name is that of Richard Bone, in my ears one of the more entertaining electronic musicians in the States today. "Entertaining" because of his playfulness and ambition to flex his creative muscles in different genres. Electropica took on bossa-nova to fine effect, while his first release on Hypnos, The Spectral Ships, was a brilliant thematic effort at dark ambient. With Ether Dome, Bone turns to somewhat lighter atmospheres. "Meant to reflect moods that occur as consciousness slips away", this latest CD harks back to his first excursions in ambient with Ambiento and The Eternal Now. In contrast with the "typical" ambient template, Bone simply cannot resist a good tune, and all the pieces here feature beguiling melodies drifting among the sythesizer sweeps, significantly enhancing the pleasure principle. Spacey, soothing, suggestive." Richard Bone's musical history includes dalliances in electropop, mamba, vintage jazz, Bossa Nova, and more. With Ether Dome, he delves into cosmic ambience, though it is an ambience laced with a minimal, melodic foundation. The eleven tracks profess to "reflect moods that occur as consciousness slips away." I find myself drawn to the more almost experimental tracks, as well as the tracks that communicate a delicate, fragile beauty. From the former: the primal aural ascension of "The Letheon Men," a synth in observance, peering into a frozen, (Island Of Dr.) Moreauesque abyss, crystals resonating in response to the moody synth; and "Plateau To Level 30," odd sounds flitting through the background, as the synths raise the listener to the plateau in question, an undercurrent of breathing present throughout. From the latter: "Unawakened" with its sad, frail piano line, synth slivers gently sliding into the smooth ivory crevices; and "Calenture," despondent synths in reticent resignation, occasional piano filling the crevices here, slipping off into realms of mental mist... The tracks are slow to build, the minimal synth/piano interplay lingering unobtrusively. Reminiscent of the calm (though sometimes lightly jostled) onset of dusk, or the disintegrating dream at dawn."